It doesn’t take much to cause ripples in a staid Arab society, so the impact on Syria of its British-born first lady, Asma Assad, has been nothing less than seismic. From the moment she married the country’s president, Bashar al-Assad, eight years ago, she threw away the rule book. The first thing she did, for instance, was to disappear from public view. Back in Damascus she held a reception and astonished her husband’s ministers by mingling and introducing herself to everyone instead of gathering them around a long, formal dinner table with herself and her husband at the head. Her warm, informal style has persisted, despite the muttered disapproval of the old guard, formed under the rigid regime of Bashar’s father Hafez al-Assad. It was very much in evidence last week, on a visit to the Massar education centre in Lattakia, northern Syria – one of her pet projects – where she slipped quietly into the back of a room in which teenagers were discussing the internet (including their belief that their government blocked certain sites) and ended up in a spirited debate. Afterwards she stopped to talk to a group of little girls, shaking hands and kissing each one in turn. The parallels with Diana, Princess of Wales were inescapable: listening to one of the children play the piano, she told the entranced remainder that the music made her want to get up and dance. “They looked at me and said, ‘Me too, but we didn’t want to say’,” she laughs. The analogy with Diana does not run much further, though. Our golden girl was 19, naive and self-confessedly “thick as a plank” when she married the Prince of Wales. Assad, 33, the daughter of a prominent cardiologist, grew up in Acton, west London, left Queen’s college, an independent school in Harley Street, with four A-levels, including maths and economics, and got a first in computer science at King’s College London. She spent two years at Deutsche Bank, then joined JP Morgan – where she specialised in mergers and acquisitions – working for nine months in the bank’s Paris office and for 18 months in New York. She talks fluently of Syria’s economic situation and the overhaul of its education system. “The Israeli barbaric assault on innocent Palestinian civilians has been horrific,” said Her Excellency Mrs. Asma Al-Assad, the First Lady of Syria, echoing the call as “Again, give peace a chance”. Mrs. AL-ASSAD: Just imagine your children living in Gaza. How could that reality be? Let's talk through the scenario. You wake up in the morning, you feed -- you give your children a glass of milk. Mothers in Gaza can't do that. But why? Because no milk gets through. You send your children off to school knowing that they'll be safe, knowing that they're going to get a good education. Mothers in Gaza don't do that. Children don't go to school because it's not safe, because -- it's just beyond belief, to be honest. You cook a meal. Mothers in Gaza can't cook. Why can't they cook? Because they don't have access to fuel. They don't even have access to the basic food stuff (ph) that is required to get a meal together. So children don't eat. Mothers -- think about when you put your children to bed at night. This is something I think on a daily basis. You put your children to bed at night and you expect to see them in the morning. That's a luxury that people in Gaza just do not have. So what would it have been like for you having -- living under those circumstances? That is something that we just cannot survive and wait for it to stop. CAL PERRY, CNN INTERNATIONAL CORRESPONDENT: Let me ask you this, are you sad? Are you frustrated? Are you angry? I mean, you have to go to these meetings, you have to go to these dinners. Is it difficult with what's going on? Mrs. AL-ASSAD: It's been difficult to smile, and that's not just me, it's a lot of people that I'm meeting, it's a lot of people that I'm talking to. It's the U.N. agencies on the ground that are seeing some really horrific things. The stories of the psychological trauma that we're not hearing on our TVs, we're not seeing on our TVs and we're not reading in our newspapers. It's something that's going to have a long-term effect on life not just in the region, but actually in the global community that we all live in, because when you see people suffering like this, it doesn't give you a sense of optimism, it doesn't give you a sense of hope. If anything, it pushes you to become more desperate, and when you are desperate, you have nothing to live for. PERRY: Now, the Israelis say they're protecting themselves, right to self-defense, they're under bombardment of missiles, their children are under threat. Mrs. AL-ASSAD: Lift the embargo. Lift the embargo. It will -- lift the embargo and engage in a peace process, a real process. As you said, talk is cheap. It's not enough to say that we want peace. What are you going to do to achieve peace? What we're seeing on our TV is not a step in the right direction. PERRY: Do you have any optimism for the future, in the near future? Mrs. AL-ASSAD: You have to remain optimistic. You have to remain -- you have to try and keep working towards your goals and objectives, otherwise you get sucked in with everything else that's going on. So, yes, you have to. It's difficult, especially at times like this, that you have to keep looking in the direction that you want to go. You have to keep not just looking, you need to keep working towards it, to be honest. And you need to grab every opportunity, every platform, every exchange, every experience to work towards the agenda that is set, and that is peace. DAMASCUS, March 21, 2009- Her Excellency Mrs. Asma Al-Assad honored in celebration of Mothers Day a number of Syrian Women who have eradicated illiteracy. “Every mother among those present here has had the ambition and will to seek the best; the way of learning and knowledge is the best of the best for the individual well as for the society. Thus, every mother here has completed her role as a mother and a teacher simultaneously; where she has been able to bring the children up and to teach them,” said Her Excellency Mrs. Al-Assad. “Illiteracy eradication is not the objective itself; rather it is the prelude and the means as to enable the individual to learn, improve capabilities, acquire skills in this age, where science and technology get developed quickly. 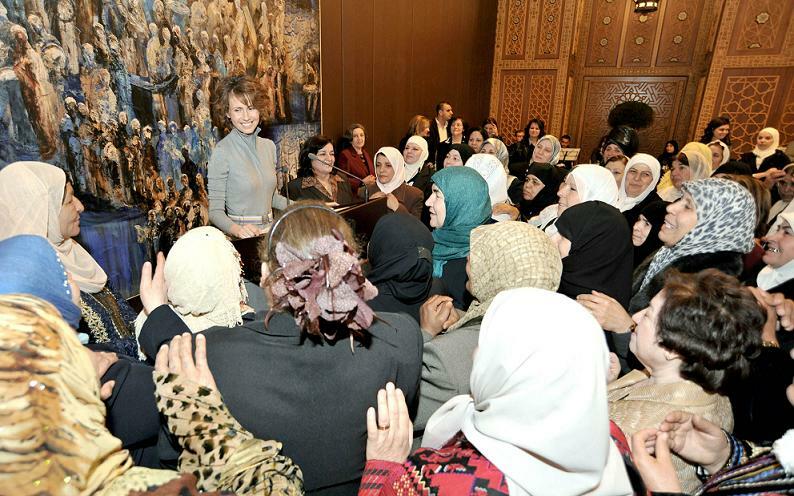 We aim to achieve this goal with focus, confidence and determination,” added H. E. Mrs. Asma Al-Assad. “The State in collaboration with Civil societies have been exerting great efforts as to eradicate illiteracy; important achievements have been realized,” said Mrs. Al-Assad expressing the hope as to eradicate illiteracy from all of Syria by 2016, now that the illiteracy was eradicated in the Governerates of Qunaitra, Sweida, Tartous, and to be eradicated by the end of 2009 in the Governerates of Hama and Dara’a. “Motherhood is but infinite love, and responsibility throughout all our age. We all, women as well as men, have to take part in the construction, developing, and solidifying of our Homeland, and this is the objective second to none.” the First Lady of Syria, Mrs. Asma Al-Assad reiterated. Syria’s First Lady Asma al-Assad met Thursday morning the Executive Director of Hayastan All-Armenian Fund Ara Vardanyan at Golden Palace Hotel in Yerevan in the presence of Armenian First Lady Rita Sargsyan and Armenian Foreign Minister's wife Natalia Nalbandian, the fund representatives, the press office of the fund reported. At the guest’s request, the fund structure, principles and work experience were introduced. Parties also touched upon the fund raising mechanisms. After watching the film on fund’s activities, Ara Vardanyan answered Asma al-Assad’s questions. Syrian first lady said, Armenians and Syrians are similar in that they both have big diaspora communities. Apart from the 18 million Syrians living in their homeland, there are 15 million others living beyond its borders. She said, Syrians often express willingness to make investments into their country’s economy, hence an institution like Hayastan All Armenian Fund may help realize a number of projects. At the end of the meeting, Mrs. al-Assad invited Ara Vardanyan to Syria to introduce the fund’s activities in more detail. Syria's First Lady has exclusively told Sky News she would welcome the Obamas to Damascus. Asma al Assad's comments are the latest in a series of signs US Syrian relations are improving after years of tension. "The fact is President Obama is young," she said, "and President Assad is also very young as well, so maybe it is time for these young leaders to make a difference in the world". And she gladly envisioned welcoming Michelle Obama and her husband in a presidential palace in Damascus in the near future. "I can see myself hosting them in Damascus in the old town, meeting with people, getting a sense of how we live, who we are and what Syria's about," she said. The comments follow news America is to send an ambassador to Syria for the first time in four years. It follows President Obama's offer of a "new beginning" in relations between the US and the Muslim world in general. Asma al Assad was born and raised in London and only moved here after marrying Syrian President Bashar al Assad nine years ago. This week she is launching the latest phase in a youth movement called MASSAR, which is one of her great passions.